You will not even believe they are Steel Toe! So you want to know about the most comfortable steel toe shoes on the market. They need to be able to be comfortable in S﻿neakers, but also have the security of a steel toe boot. Job sites require you to be active, but that doesn’t mean you should compromise comfort for safety. Here are the top 5 steel toe shoes out there today. Happy walking! How To Choose The Most Comfortable Steel Toe Shoes? Make sure you have your correct shoe size. Some product vary, so checks websites to see if the shoe runs big or small, wide or narrow. This will help to ensure you have the perfect fit. Sometimes they have removable insoles, or sometimes the shoes needed additional insoles for support. In both ways, it is a good idea to have a comfortable pair of orthotics if you are going to be spending numerous hours on your feet. Check reviews and read what others have to say about the shoe. Did they find them comfortable or what do they recommend if not? Yes, we all have different sized and shaped feet, but if numerous people report the same negative point about a shoe, then you know it is bad. This is the most obvious point, but most often people forget to do. If you are searching for the best buy online, then that is fine, but go into the store and try the shoe on before purchasing it. Then you will know if you are more likely to wear it or not. What Are The Interests And Benefits Of This Product? The steel toe is a safety device for added protection in your shoe. You can work on construction sites and shipyards with security and satisfaction that your feet will be left unharmed. Shoes will allow you to be quicker on your feet and allow you to have more flexibility in the soles your shoes as compared to boots. When you have the security of a steel toe and the comfort of a sneaker, you have one of the best footwear out there for the ﻿hardworking man. This will help to keep them slip-proof and have better traction. It also offers a bit more support for your legs and feet. 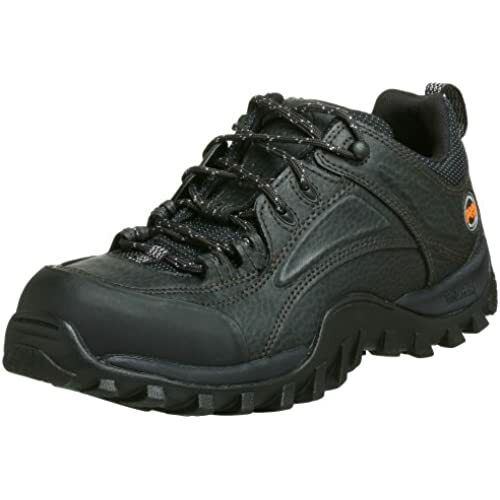 As a bonus, the rubber sole helps protect you from electric shock that may happen on a work site. That is something you should not take for granted! If you are going to be on your feet for extended periods of time, it needs to be with a ideal insole and high arches. Some have insoles you can take out and then you can put your own in if you require more comfort and support. Also, the right arches will help with back support and it also helps you be on your feet longer. These are a must. These shoes can be worn in all types of weather and are also waterproof or water resistant. They are more durable and will last longer as compared to a c﻿﻿anvas shoe or ones made of fake leather. Most websites will say if the fit is as expected or not. I would look for one that is around 80% or higher just so you know if you need to buy larger or smaller, wider or narrower. Being stuck with a shoe that does not fit properly (and may not be returnable if you wore it outside) is just miserable. What Is The Best Way To Use Steel Toe Shoes? These are most suitable for a large worksite. They are comfortable with a flexible sole and heel so you can run from site to site. The steel toe is perfect for added protection, but I would not advise you to drop something heavy or sharp intentionally on your shoe to see if it works. You can use them to do housework, mow the lawn, different chores, and just casual walks or even a run. They can be utilized the same way that sneakers are used, just with the bonus of a steel toe. You need the best shoes for walking all day , which should still be lightweight enough where doing these daily tasks should not be an issue to the wearer. New Balance sneakers are known around the world as carefully constructed comfortable sneakers that will last for years to come. They are both athletic and casual, but the steel toe adds the extra bonus of being perfect for the workplace. When people see the NB on your steel toe shoe, they know that you mean business. They have great support from comfortable insoles and arches. New Balance shoes always run true to size, and if not people selling them will be honest and tell you if they are not. These are my personal favorite brand of sneakers you can purchase. Add the steel toe to them and I would even work on a production site or shipyard so that I can have an excuse to wear New Balance sneakers to work. Some believe that the width is not accurate, but the shoe size is. These shoes are made of leather with a rubber sole to help with absorbing shock. 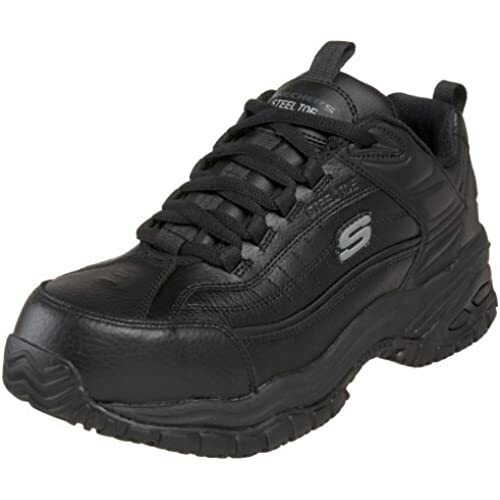 They have shoe laces along with a padded collar and steel toe. They also offer the all-great slip resistant outsole. These shoes run true to size and are made or durable leather. When a shoe is endorsed by Chevron Houston Marathon for their athletes, you know it is good enough for you and your worksite. They provide comfort and reliability everyone is looking for in a sneaker, but now with an extra steel toe for safety. These shoes are made of leather with a rubber sole. The steel toe is to help with work sites and absorb shock. They are designed for 24/7 comfort and support. They are made by Timberland, which is well known for their work boots so that you will find a solid pair of work shoes by them as well. The timberland PRO men’s low steel lace up is a new work boot which brings toughness of a work boot incorporated in a comfortable sneaker that can be worn in the streets. The boot features high quality breathability and flexibility combined with exquisite fabric to give your feet safety and protection from harmful objects. Timberland mudsill is a rugged multipurpose steel toe boot and the EVA midsole provide lightweight support and abrasion resistant features. Made of leather and has a rubber sole. The heel is about 1.25” thick. They are both oil and slip resistant with a remarkable no marking rubber outsole. Keen is known for their lightweight, yet supportive shoes and these are no different from their other work shoes. 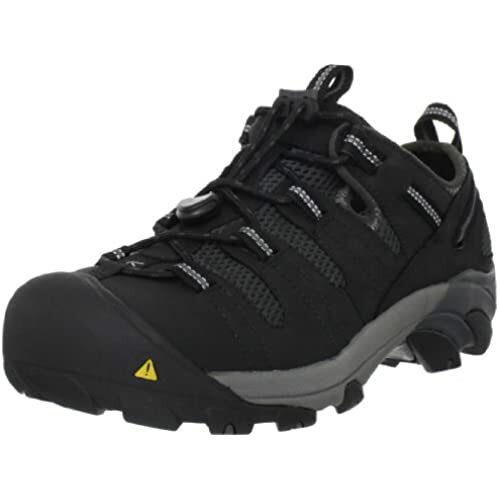 The 1006977 KEEN Men's Atlanta Cool Safety Shoes brings in a new dimension in framing, and in jobs, which little airflow is involved. The boots are light with breathable mesh and sturdy steel toe protection. The Atlanta cool steel toe boots are comfortable on the job and they can be worn from the mountains, beaches and in the city streets. With the protective mesh your feet are protected from harmful bacteria and fungi moreover, the reflective webbing allows easy removal and a stable shoe to work with. Some report that the shoe is not worth the price tag. These shoes are made of both leather and synthetic materials. They have a rubber sole with is perfect for absorbing shock on the work site. The heel is about 2 inches thick, and the memory foam insole is removable if you desire. Skechers afterbun is crafted with modern mesh fabric, smooth leather, and synthetic material, which makes the shoe lighter while providing ultimate protection. The boot features a reinforced overlay, which provides comfort and protection. The perforation on the front and the back is essential for providing airflow and this in turn prevents build up of bacteria and fungi on the feet. 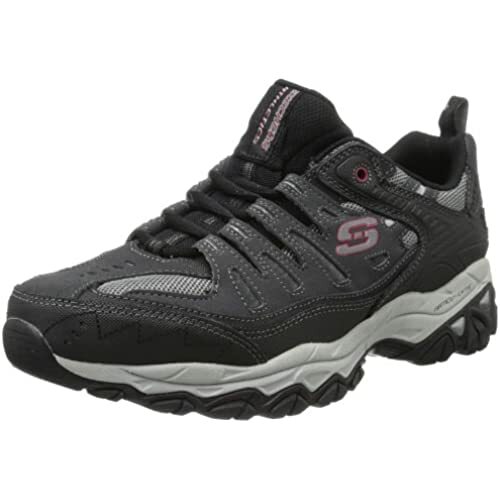 Skechers is an award winning shoe manufacturer and since its inception, high quality and comfort are the features that drive the shoe manufacturers. 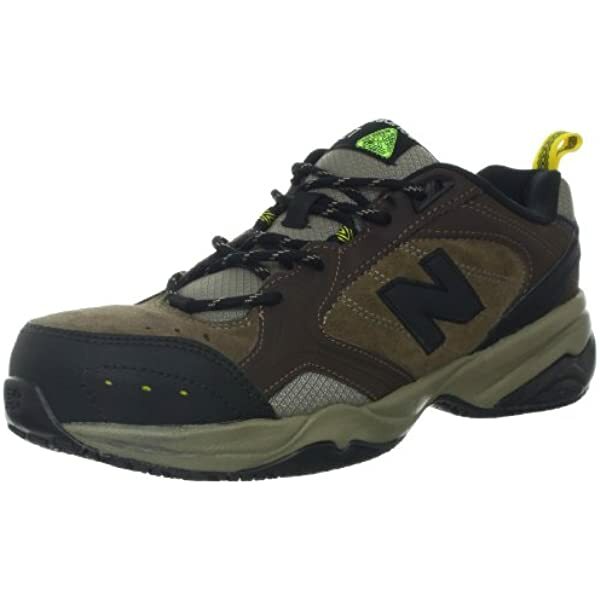 Of course, I have chosen the New Balance shoes to be the Most Comfortable Steel Toe Shoe. They are quality made and light weight. Anyone who has not worn New Balance has an excuse to try a pair on. You may need them for work someday.